I like to cook a proper meal on Sundays. It’s the one day a week I’m not running around like a crazy person trying to get things done so I take advantage by preparing a full-on feast. My favorite kind of feast is one that involves just one pot. You can do a lot in one pot. A roast with veggies, a soup or stew, or in this case a curry. 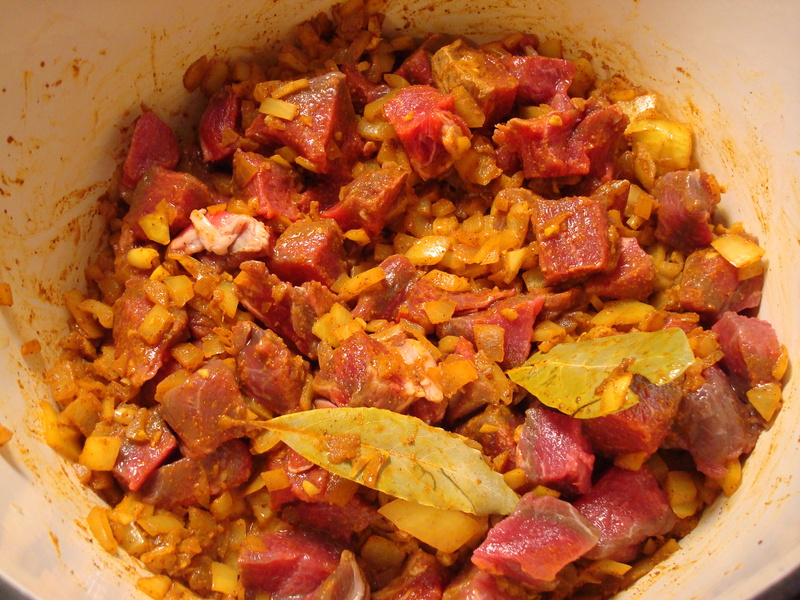 I’ve made Indian and Thai curries in the past so when I found a recipe for a South African curry I was intrigued. 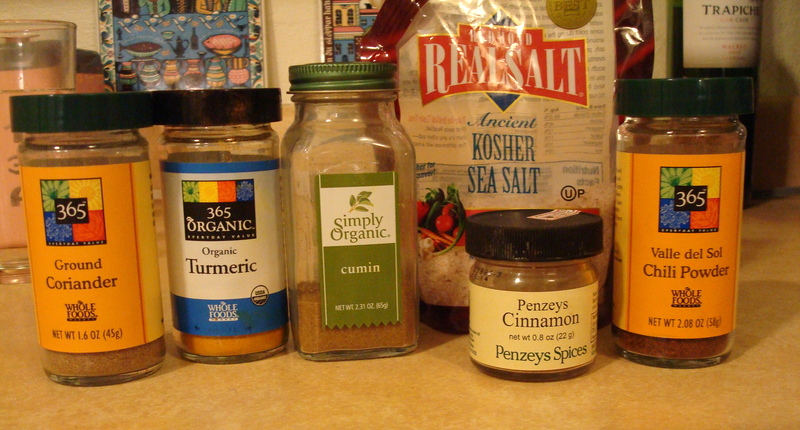 The recipe called for a combination of foods I had never seen before: green peppers and… dried apricots. I was totally skeptical but it worked. 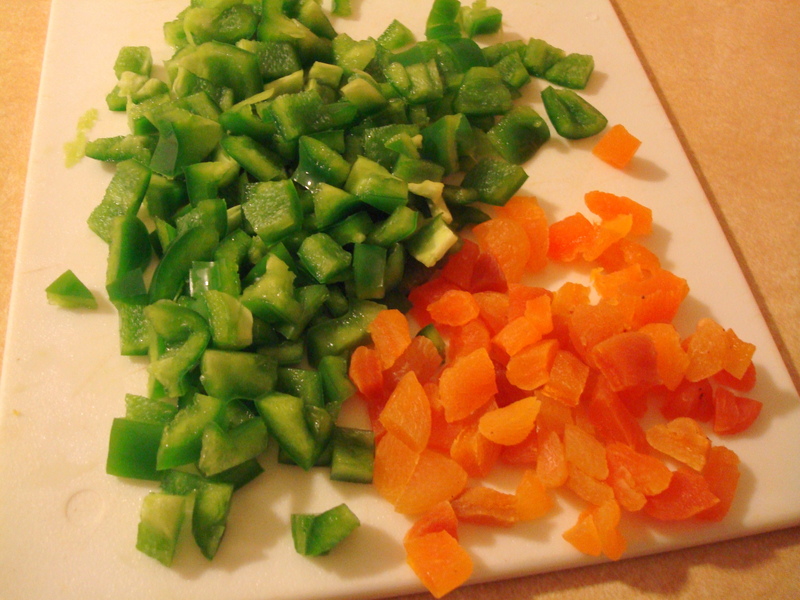 And the two colors looked nice together on my cutting board. Bonus. The prep time for this dish takes about a half hour and then you just let it stew for an hour and change and it’s good to go. Serve it over rice, noodles, or mashed potatoes and enjoy. And enjoy having fewer dishes to clean afterward! Heat oil in a Dutch oven over medium-high heat. 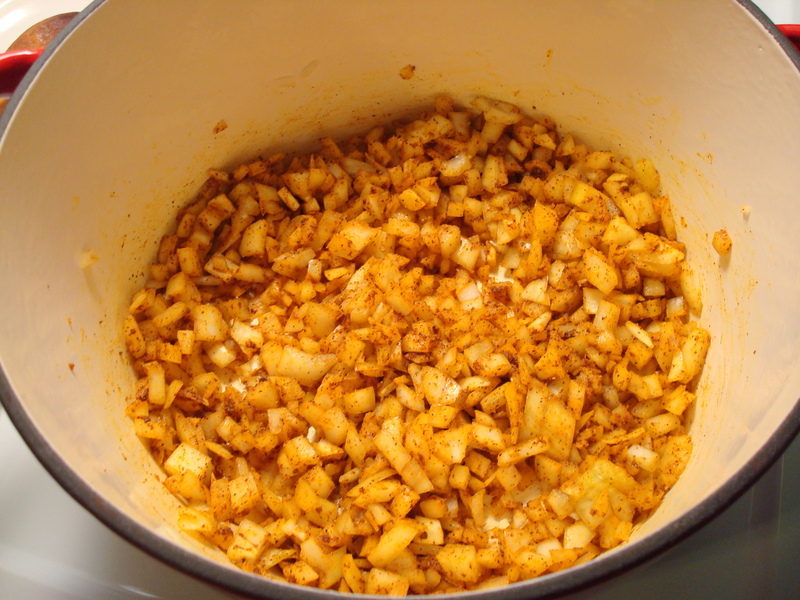 Add spice mixture; cook 15 seconds, stirring constantly. Add onion; sauté 2 minutes. Add ginger, bay leaves, and garlic; sauté 15 seconds. Add beef; sauté 3 minutes. Add broth and next 5 ingredients (through vinegar); bring to a boil. 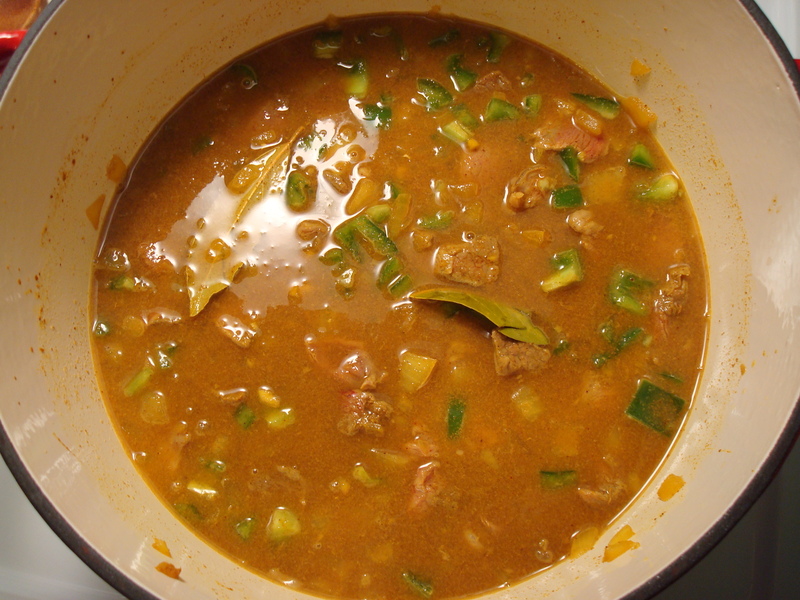 Cover, reduce heat, and simmer 1 1/2 hours. Uncover; discard bay leaves. Simmer 30 minutes or until beef is very tender. Remove from heat; stir in buttermilk. Lentils or chickpeas in place of the meat, and I am game to try this dish. Have you tried Japanese curry? I have a couple recipes…yum! I haven’t made a Japanese curry before- send me some recipes and I’ll get right on it! How do you think it would be without apricots? I have everything at home except that. Do you have any other kind of dried fruit at home? I think it would work with raisins or currants or prunes, etc. as long as the dried fruit is sweet and not tart like cranberries or cherries. The tartness would throw it off I think.